Saw some of the pictures from Megan and Ezra's wedding in July. They are models. An unstaged photograph. Natalie probably filling us in on the latest high school dish. It was also freezing cold and raining, but I layered up with three jackets, hand warmers, sweatpants, and a beanie. I looked like a marshmallow, but it was worth it. We went to the store afterwards and found spaghetti sauce on sale (score! ), picked up some orange juice for Derek since he had been craving it, and got a few of the Mochi ice cream bites for Derek to try. A little bit of Friday night relaxation. Derek and I tried to go bowling on Saturday night for a date but all of the lanes were busy. 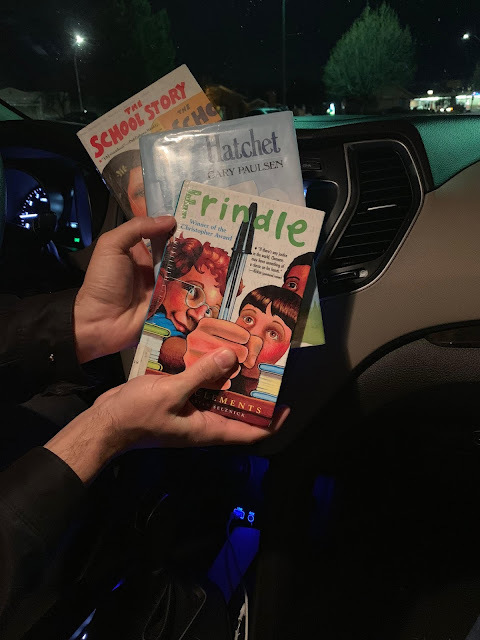 Instead, we stopped at the library to get some sophisticated weekend reading (Derek has never read Frindle which is insane and I have never read Hatchet which is insane to Derek so we got the necessary supplies to remedy that issue). What's funny is currently Derek is reading Hatchet and I am going to start Frindle. We also stopped at the store to get some supplies for dinner. Derek made turkey drumsticks with red and yellow potato (I had a sweet potato) and we had salad on the side. It was amazing. He also massaged my shoulders for approximately 7.3 hours. He's the best. A fall-ish scene while checking the mail today. Happy Monday! Life is beautiful!